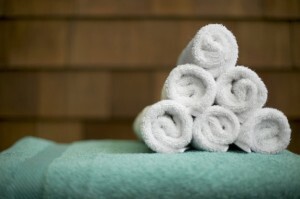 Solid towel rental service can help to create a gym client for life. Society has become more and more health-conscious, leading to a huge surge in gym facilities and client membership. At no time throughout the year is more evident than when the summer hits and the weather heats up. With so much competition, potential gym members have learned to get a bit more savvy when it comes to choosing which gym is best for their own unique needs. While online research can answer many of their questions: what classes are offered and when do they take place, which equipment is available, and — of course — what are the monthly or yearly rates, there is no substitute for a great in-person experience. If you are a gym owner or manager, hygiene and professionalism trumps any add-on bonus that you can offer, and one amazing service to extend to your clientele is solid, guaranteed towel rental service. Are Complementary Towels a Perk or a Necessity? In any service industry, customer service is, by far, the greatest asset in creating a reliable base of customer retention. In the health and fitness industry, however, other factors work to truly draw in clients for, potentially, years of loyalty. Hygiene may be the key factor, but with so much competition out there, many gym owners have to go out of their way to add perks and amenities to satisfy all aspects of their clients’ needs. By providing complimentary towel service, members will feel taken care of, and your towels will not only always look neat and clean, but give off the right image of hygiene and cleanliness that your demography requires for comfort and habitual gym visits. In general, a fresh supply of clean towels is a very basic necessity for a functioning gym. However, depending upon the size of your gym, the practicality of storage and constant in-house laundering can not only create problematic costs, but a larger budget allocated towards your employees who must wash and stock every item. Towel rental solves each of those problems before they ever arise. Paying only a single monthly fee guarantees that you will never have to worry about storage or laundering costs and responsibility. And, best of all, by choosing a great towel rental provider, you’ll never run out of supply or worry about freshness and wear and tear. When those crucial prerequisites are met, membership retention becomes all the more attainable. This entry was posted on Friday, August 4th, 2017	at 9:12 am	. You can follow any responses to this entry through the RSS 2.0	feed. Both comments and pings are currently closed.